Often, before you even call, Maverick has prepared to respond to the potential Catastrophic events from Hurricanes to Ice Storms. To avoid confusion in the midst of a storm situation, your local Mavericks and One Source Powers state-of-art storm center, located at our headquarters in Boston Massachusetts, monitors major storm systems and quickly notifies key personnel in areas that may be affected. assessor. Each assessor has substantial restoration experience and distribution experience. Assessors are used pre- restoration to provide an accurate view of the conditions and required resources needed to complete the task of restoring power effectively and safely, and they are used post restoration to ensure work has been completed. Maverick with its Storm Response Command Center, provides self-contained quick responsive Secondary Crews that are dispatched to quickly restore power and assess storm damage. 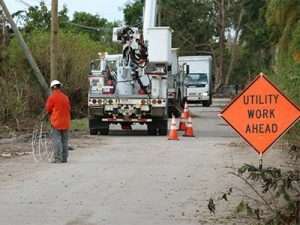 These Secondary crews are more nimble than primary crews are used to directly impact affected areas allowing primary crews to focus on line work. These Secondary crews are the hand to hand combat. the required skills to set up remote field store operations. transformers. Our team has the knowledge of the proper process of retrieving and the disposal of hazardous material.